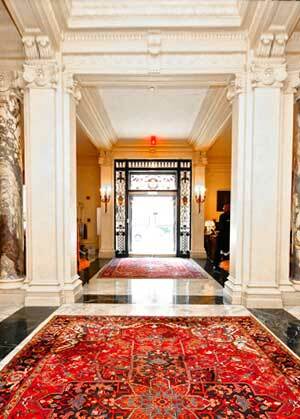 The Townsend House is one of the jewels of Washington's Embassy Row. Standing on a site of almost one acre at 2121 Massachusetts Avenue and flanked by gardens, the mansion is one of the great turn-of-the-century residences that give Massachusetts Avenue its stateliness. The Townsend House is important both as the work of a renowned architectural firm and for its place in Washington's history. Its preservation is also important to retaining the character of the Dupont Circle and Massachusetts Avenue Historic Districts of which it is part. Dupont Circle became Washington's most fashionable address in the last quarter of the 19th century. The development of what had been an outlying area of working class shanties, slaughterhouses, and a brickyard was spurred by the public works improvements inaugurated by "Boss" Alexander R. Shepherd in the early 1870s, including street paving, tree planting and the laying of water and sewer lines. Among the first investors was a syndicate of California mine owners, one of whom, Curtis J. Hillyer, built a house on the site now occupied by the Townsend Mansion. The social cachet of the area was set with the building of the British Embassy just south of Dupont Circle at Connecticut and N Street in 1875. Within the next several decades Dupont Circle was ringed with the mansions of families who had made their fortunes elsewhere but wished to establish a social presence in the nation's capital. The Townsend House is one of five surviving, exceptionally grand, residences that were built around 1900 within two blocks of Dupont Circle. Although the side streets of the Dupont Circle area are lined with townhouses of varying sizes and degrees of individuality, houses built on Dupont Circle and along the near blocks of Massachusetts Avenue were generally freestanding and much larger. They were designed for entertaining on a lavish scale and their hostesses were important figures on Washington's social scene. The Townsend House was built by Mary Scott Townsend, daughter of William L. Scott, a Pennsylvania railroad and coal magnate who became a Member of Congress. As an heiress to his fortune, she was a woman of great wealth. She became one of Washington's social leaders, known for her elegant entertaining. Mrs. Townsend's husband, Richard H. Townsend, died shortly after the house was completed, but she continued to live there until her death in 1931. Mrs. Townsend's only child, Mathilde Townsend Welles, and her second husband, B. Sumner Welles, President Franklin D. Roosevelt's Under Secretary of State (from 1937 to 1942), maintained the mansion until World War II when it was leased to the Canadian Women's Army Corps. The Cosmos Club purchased the building from Mrs. Welles's estate in 1950. Mary Scott Townsend bought Curtis Hillyer's substantial residence and property at 2121 Massachusetts Avenue in 1898. She hired a leading New York firm, Carrère and Hastings, to enlarge and so completely rebuild the house that none of the original 1873 structure is visible, although some of its walls were incorporated. Construction of the Townsend House was begun in 1899 and essentially completed by 1900, although some modifications were made over the next decade. Like its contemporaries along Massachusetts Avenue, the Townsend House is a product of the Beaux-Arts school. Its architects, John Merven Carrère and Thomas Hastings, both received their architectural training at the Ecole des Beaux Arts in Paris. After a stint as draftsmen with the prominent New York firm of McKim, Mead and White, they formed a partnership in 1885. By the time the Townsends selected Carrère and Hastings to design their Washington residence, the firm had built hotels, churches and estates along the East Coast from Massachusetts to Florida and had won the competition to design the New York Public Library. In Washington the firm is also represented by important institutional buildings: the Senate and House Office Buildings (1905-06), the Carnegie Institution (1906) and the Memorial Amphitheater at Arlington Cemetery. The exterior is inspired by the style of Louis XVI. The building, of Indiana limestone on a rusticated Milford granite base, consists of a three and one-half story central block flanked by two-story wings, each crowned with balustraded parapets. As was typical of grand houses of its era, the interiors evoke a variety of French historical styles. They were designed by the Parisian firm Jules Allard & Sons. The mansion's principal elevations and reception rooms have been preserved much as they were designed and include a Régence ballroom and a wood paneled library in the style of Henry II. Although distinctly different in detail, the Townsend mansion is stylistically in keeping with the neighboring great mansions of its era: the ca. 1900 Wadsworth mansion (now the Sulgrave Club) and 1901 Patterson mansion (later the Washington Club), both on Dupont Circle; the 1901 Walsh mansion at 2020 Massachusetts Avenue (now the Indonesian Chancery); and the 1902 Anderson mansion at 2118 Massachusetts Avenue (now the Society of the Cincinnati). Most are built of stone, and all have opulent exterior detailing drawn from French and classically inspired antecedents. Together these mansions evoke the era of great wealth and extravagant show and entertaining that marked the turn of the 20th century. Their preservation is essential to maintaining the beauty and distinctive character of the Massachusetts Avenue corridor and its history. The Townsend House's architectural and historic significance is formally recognized. It is individually listed in the National Register of Historic Places. It is also included in the Historic American Buildings Survey District of Columbia Catalog and is designated as a District of Columbia Landmark.